Have you heard of baby-led weaning? Not to be confused with weaning babies from the breast, baby-led weaning is a feeding method that introduces food to babies without pureeing or mushing the food first. My experience with this feeding method has been bitter-sweet. I love giving my son a hunk of cucumber or beef and watching as he grabs, licks and gums the food. He is learning hand-to-mouth coordination as well as self-feeding. He decides when to put the food in his mouth. He is discovering so much, including texture and taste. The bitter part of the story is the chocking hazard. While he can’t exactly bite off a chunk, he can (and has) broken off a piece large enough to gag. While there is a big distinction between gagging and choking, I still feel my maternal alarm bells go off and panic rising at my son coughing and gagging on a piece of food. It’s happened with beef. While he happily squished a hunk of roast in his tiny fists, jamming it into his mouth (and nose) I could tell he was absorbed in the experience. At the first sign of gagging we took away the beef and my husband fished out two pieces of dime-sized beef from his mouth. Could they have gotten stuck and blogged his air passage? Don’t know, but it’s a risk I’m not willing to take. The next scare we had was with cucumber. Again, he was happily munching away (I suspect the cool cucumber is soothing for his teething gums) he started to gag so bad he actually threw-up. Not baby spit-up, but full-on barf. The baby-led weaning experts will say this is precisely what should happen. A baby’s gag reflex will work to prevent chocking. And I’m glad my son’s gag reflex is working. But the question remains. What if it doesn’t? I continue to be weary of this feeding method. 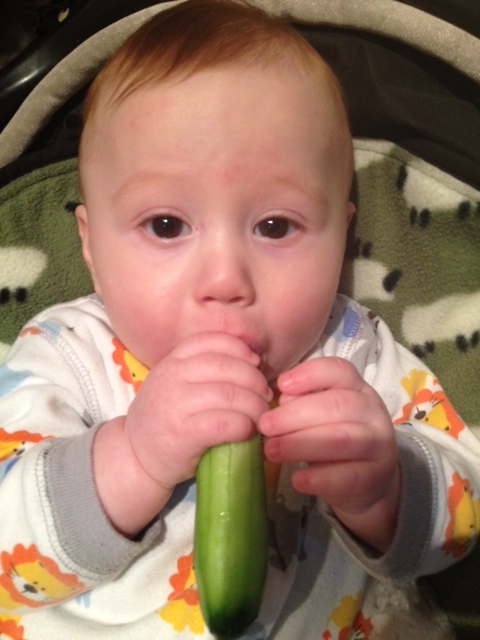 The jury is still out… Meanwhile, here’s the little tike with his beloved cucumber. Photos courtesy of Buzzfeed.com unless otherwise stated. And for every single moment anything like this happened. While I sit in my home office and watch the last of the leaves cling to the bare branches, cold air blowing and not a reprieve in sight of the endless grey clouds, I contemplate the November blah’s. Here is a piece of advice that is surely written more for myself than anyone. GET OUTSIDE! There I said it. Now, I have to do it. When the weather turns, the first thing I want to do is crank up the heat and stay cuddled in blankets drinking camomile tea. No I’m not sick, just reacting to this grey, cold weather. Get out and run, my mind says. An avid outdoors-woman, I know the fresh air will cure whatever ails me. It always has, it always will. Why is it that the one thing I should do is also the last thing I want to do? Catch-22 indeed. Here is a very real picture of the doom that awaits outside my front door. No filters, no PhotoShop people. 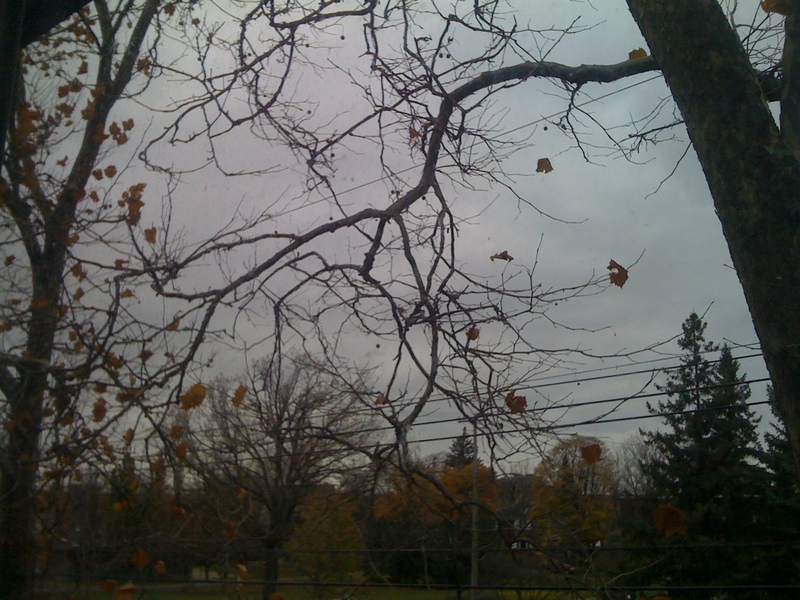 This is November in all her gloom. Bring new life to old crates! In my ongoing quest to organize my apartment, I have found great storage use from old crates. While this is not a new concept (and reminise of many college dorms!) 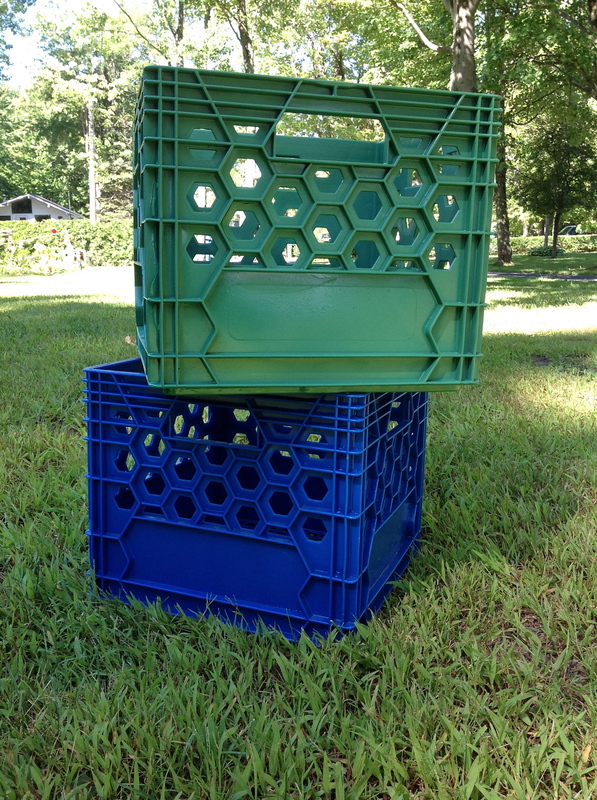 – my take on plastic crates is to PAINT THEM! Spray paint works best. Which is unfortunate because I try to avoid the spray paints. Bad for the environment and expensive ($5 for only 16 oz of paint). However the coverage is great! You can see in the photo below how ordinary plastic crates can become extraordinary for your storage uses with just a simple spray of paint! Old milk crates make great storage units. Now you can bring them back to life with a simple spray of paint! My new hobby – Furniture Restoration! I’ve recently fallen in the love with the idea of refurbishing furniture! I love it for many reasons. Primarily, I reuse furniture that would otherwise be thrown away. AND I get a fresh piece of furniture …for free (well, almost)! I have a few pieces I’ve already refurbished and will update this blog with the finished product. Regrettably, I didn’t photograph before, during and after! But I will begin to do so! 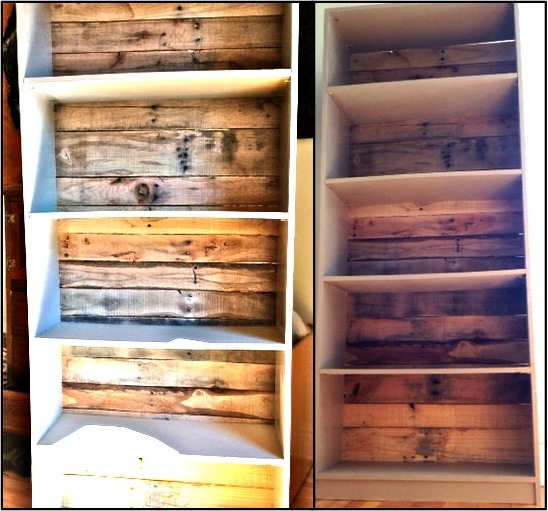 For now, I leave you with my 4th refurbished piece, the bookcase! I took a crappy old bookcase (very ugly) and tore off of the cardboard backing. I primed the shelves with a primer (Zinsser!) and painted them a toasty taupe. I then cut pallet board wood (mega job!!) to line the back of the shelves – in replacement of the cheap cardboard. And Ta-Da! I love it! 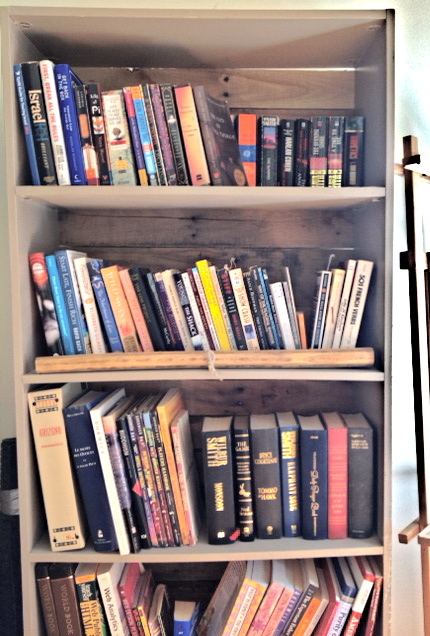 It is sturdy and you can see the pallet wood behind the books – very rustic. Stay tuned! The pallet wood shows through for a rustic country look! One of the cool things about this video are the quotes. Now get out there and make it count!! Besides running, my other love is Mexican food. I try to avoid meat so I have perfected a veggie taco recipe, and it is quite delicious! Start with veggie round. I like Yves Original Veggie Ground Round. Saute onion with veggie round until onions are translucent. Add 1 cup of water and any taco seasoning mix. I like Old El Paso Taco seasoning mix. Let simmer until water has evaporated and you have the right consistency. You’ll find the veggie round a perfect substitute for meat and you won’t be able to taste or tell the difference! Next I mash up some avocado with diced onion, squeeze of lime and some chopped coriander. For salsa, chop tomatoes, add diced onion, coriander and I always add some extra spicy hot Thai chili peppers! Add salt and pepper. You can buy round tostidos or simply use hard shell tacos broken in half. 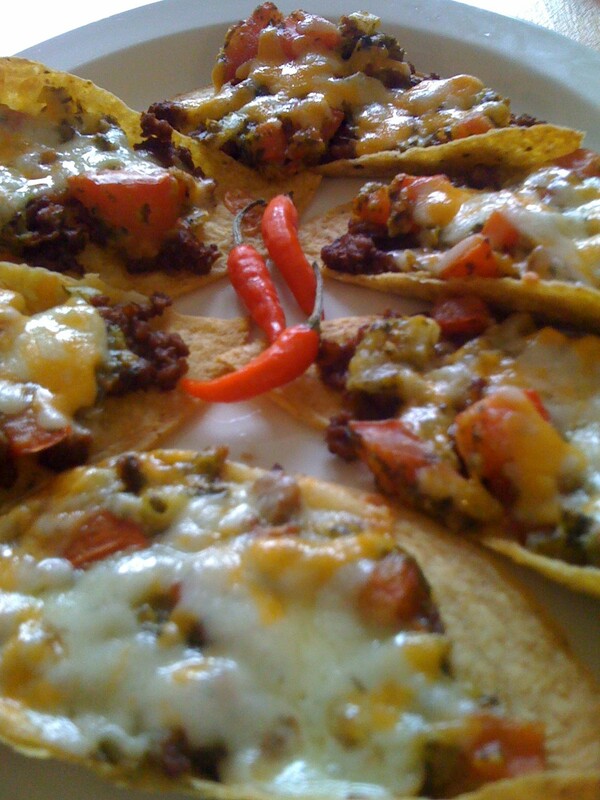 Lie shells on baking sheet, add veggie mix, spicy salsa and top with cheese. Bake in 350-degree oven for 20-minutes. ENJOY with homemade guacamole! Ole!